Base of Operations: The Times Tower, N.Y.C., U.S.A.
First Appearance: Daring Mystery Comics #7 (Timely Comics, April 1941). Powers/Abilities: The Blue Diamond was invulnerable, with skin strong enough to repel most attacks. His fingers could cut glass. He had some degree of superhuman strength. In later stories, he mutated further to have skin which also looked like it was made of diamonds. History: (Daring Mystery Comics #7, ga) In 1941 Professor Elton Morrow and a colleague discovered a huge glowing diamond in the Antarctic. Returning the the United States, the ship he was travelling on was sunk by a German U-Boat. The Professor managed to stay afloat using the box containing the diamond, only to be spotted by the German sailors, who machine gunned him. The box exploded, and the diamond fragmented, with pieces embedding in Morrow's skin. Somehow this transformed him, granting his body diamond-like properties. Rescued from the freezing waters by a British Destroyer, Morrow made his wat back to New York, where he decided to become a crimefighter. ("The Hypnotised Ghosts", Daring Mystery Comics #8, ga) No synopsis available. (Marvel Premiere #29) In early April 1942, Elton was giving a lecture in New York. Nazi agents burst in and tried to take everyone hostage, but they had not reckoned on having a superhero in the midst. A little later the Professor heard Bucky making an impassioned plea for help, as his team mates in the Invaders had been brainwashed by the Red Skull. The Blue Diamond was one of a number of heroes who responded to this cry for assistance, forming the Liberty Legion. (Invaders I #6) A day later the Liberty Legion publically unveiled themselves to the press. They took on both local Nazi spies and the brainwashed Invaders. 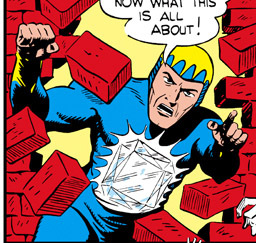 The Blue Diamond and Jack Frost took on the Sub-Mariner at the Statue of Liberty, and managed to defeat and capture him, though Namor later escaped. (Marvel Premiere #30) The Blue Diamond and the rest of the Liberty Legion battled the mind-controlled Invaders at Yankee Stadium, managing to free them from the Red Skull's mind control. (Marvel 2-in-1 Annual #1) When the Fantastic Four's Thing travelled back in time, he encountered the Blue Diamond. The Diamond then battled and was defeated by Nazi superhuman Master Man. 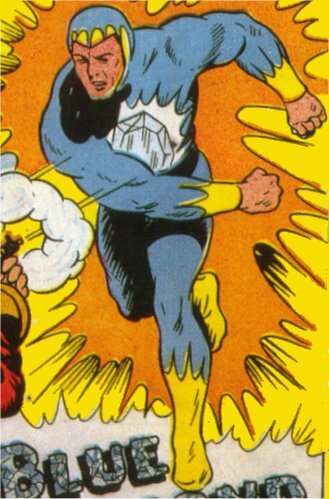 (Marvel 2-in-1 #20) With the Legion gathered, they helped the Thing battle several German supervillains. (Invaders I #35-37) The Liberty Legion and the Invaders battled the armoured German agent Iron Cross. (Citizen V & the V-Battalion II #1) In 1953, several years after retiring from active crimefighting, the Blue Diamond attended the funeral of his old ally, John Flasworth, the Union Jack of World War Two. (Marvel 2-in-1 #79, bts) The Blue Diamond retired and married his childhood sweetheart. (Marvel 2-in-1 #79) Years later and now widowed, the Blue Diamond became the mate of the extra-terrestrial Star Dancer, mutated into a less human, more crystalline form, and set off into outer space. (Thunderbolts #46) It was revealed the the Diamond's powers actually came from shards of the Lifestone, which had also given powers to Moonstone, Ulysses Bloodstone, Man-Wolf, Dr.Spectrum and others.